Puppy classes based in Bushwick, Brooklyn. We're excited to announce the latest addition to our training roster designed especially for your new (furry) friend. 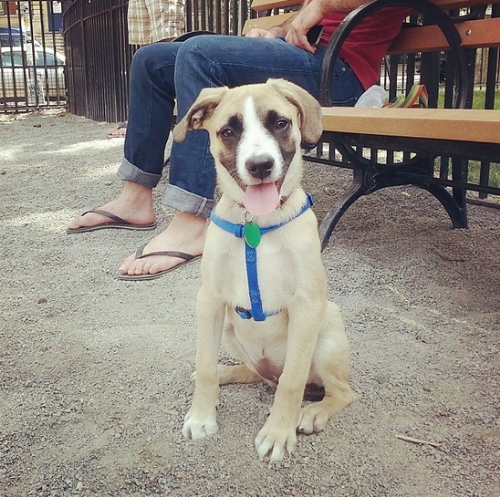 BushwickK9's puppy classes teach you to help your pup adjust to his or her new home! Classes run for approximately one hour once a week--with a short break for play time, of course. We'll cover commands like "sit," "come," "stay", "leave it," and "focus (watch me)." Topics of study include leash walking, meeting people and dogs, how to properly interrupt play, and what types of play are fun and appropriate. Most importantly, you will leave these classes understanding how to continue training your furry companion into the well-behaved dog you’ve always wanted. We start from the beginning, by covering basic learning theory. You will learn how to reward calm, good behavior with eye contact and start on some basic commands like "sit," "down," "watch me," and "look." Having trouble keeping up with your new puppy? In the second week we will discuss house rules and tips while also learning about impulse control. Commands covered include "down with duration," "settle," and "come." Your dog is a social creature just like you. Understanding how to work with your dog in social situations is a crucial step towards a happy and fulfilling life together. Topics covered include how to meet and greet other dogs, human jump prevention, walking on a leash, and how to address distractions while walking. What happens when you let your dog off the leash? In week four we explore the "come" command in more detail and practice getting your dog's attention from a distance. We'll also spend more time working on good behavior while walking on leash. Other topics covered include sitting at a distance. The best behaved dogs don’t need to be told what to do. This week we will learn to prevent resource guarding, anxiety and reactivity and examine the "stay" command. We'll also review all the material we’ve covered thus-far, and get in some play time, too!